In boiling salted water boil the spaghetti to 'al dante' stage, allow it to cool & sprinkle olive oil so that it doesnt stick. Heat oil in a pan. Add in the Green chillies & garlic & sweat. Add in the sliced onions & allow it to sweat. Add in the peppers & carrots & allow it to cook until soft. Add in the spaghetti along with tomato ketchup & soy sauce & mix well. Check seasoning & serve very hot. Tips : In the same way in a hot pan just add garlic & add in tomato sauce & mix in the the spaghetti to make original italian SPAGHETTI IN TOMATO SAUCE. A quick meal that totally satisfies. Wow sri kalakitinga ponga, unga style chowmien kalakala irruke...superb dish! !kids will love this for the sure!! Hmmm my fav' but never made them...this makes me crave for it. wow looks yummy. 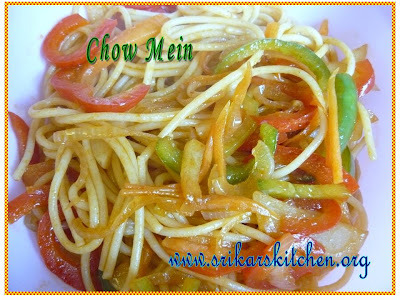 Love chow mein..perfect for kids too.. Delicious, i woiuld be very happy if i this. My son fav, tasty one! Wow... Nice and colourful recipe.. Easy to make! Hey looks very tempting. perfect meal! I make mine similarly,yours looks yum and inviting ! 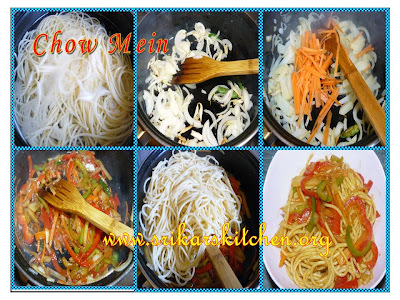 Chow mien stir fry looks excellent and colorful :D..